Reebok supplied a hooped home shirt, that is, without foreign elements interrupting the Sporting hoops. The only novelty was that te area close to the collar was completely green. The number of green hoops, seven to eight (up to nine, counting the geen area by the neck), was high, and the hoops are fairly narrow, but we note that in old Sporting Lisbon shirts, in the 1970s, also had seven hoops. The away shirt was very pretty, with gold as the main colour. 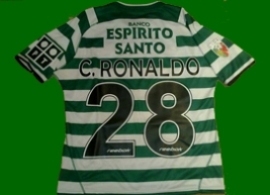 The sponsors remained the same, PT on the front and Banco Espirito Santo on the back. 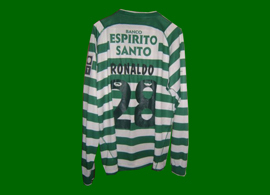 Click here to see all the Sporting Lisbon shirts from 2002 2003. Stromp shirt of João Pinto, short sleeves. It has the patch of the previous season. 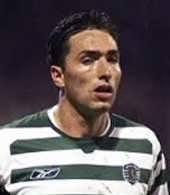 Click here to see all the Sporting Lisbon shirts from 2004 2005.